Doors Open provides a unique cultural and educational experience. For one weekend a year, the public is invited to enter built heritage treasures, cultural institutions and other buildings of interest not normally accessible to the public, completely free of charge. 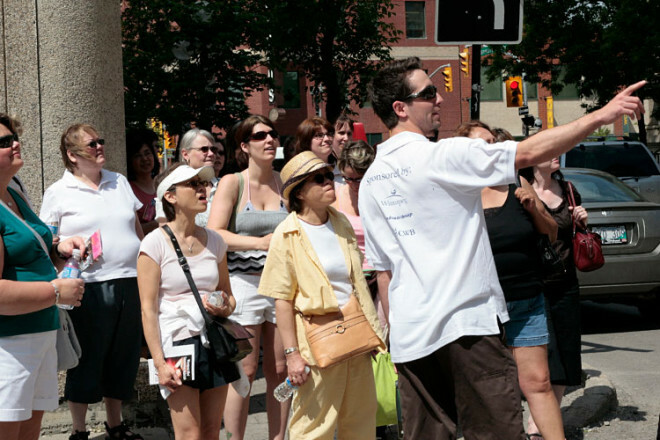 Every year, over 400 engaged and passionate individuals volunteer to ensure that Winnipegger’s have an opportunity to act as tourists in their own city. Consider joining the team this year! Opportunities are available in a wide-range of historical buildings and at a number of historical sites. If you love being active in your city and community, have an interest in architecture, history, heritage or city planning, enjoy dealing with the public, and care about Winnipeg, then we need you! Volunteer either Saturday or Sunday of the last weekend of May during the hours of 11:00 AM – 5:00 PM. If you are interested in volunteering, please fill out the volunteer form. Thanks to all of our volunteers who help make our event an overwhelming success each year.